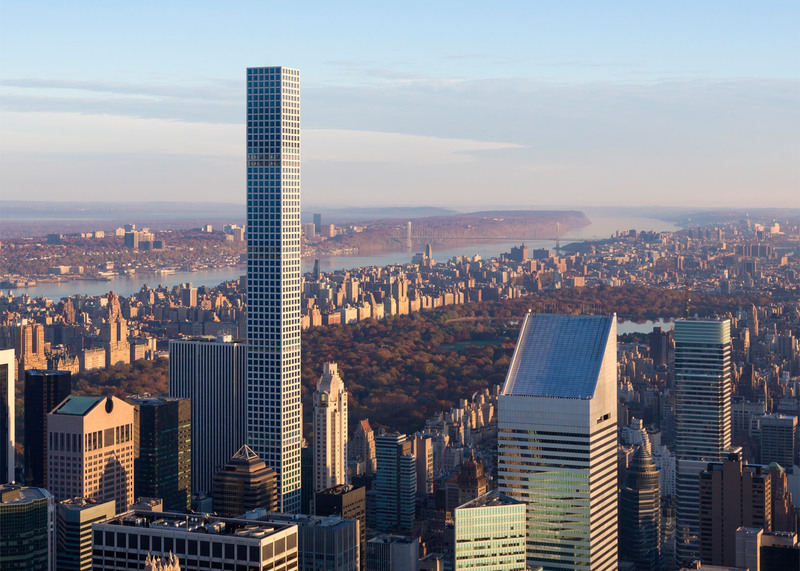 The developers of Rafael Viñoly's 432 Park Avenue skyscraper in New York have released photographs that show the facilities shared by residents of the skinny tower (+ slideshow). Residents who have moved into the 96-storey building can take advantage of three full floors dedicated to dining, entertainment and fitness. The double-height floors each feature two bands of the tower's huge square windows. 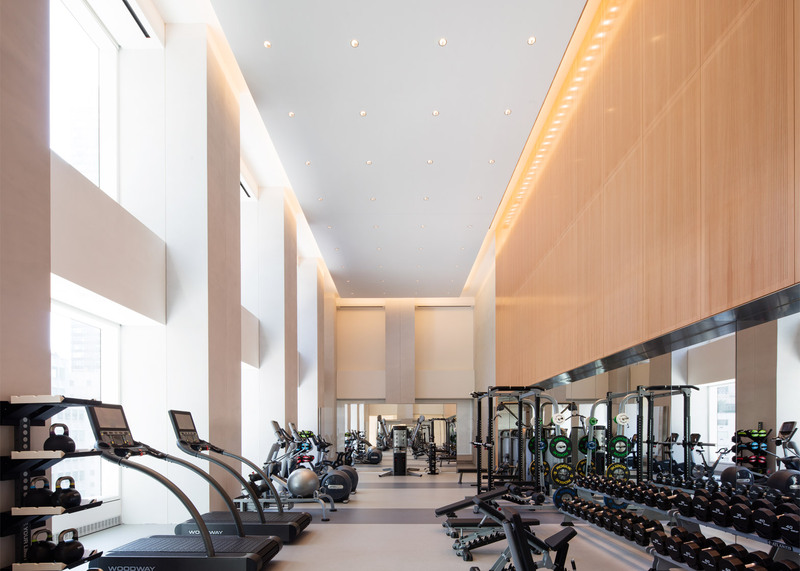 Completed amenities include a fitness centre and yoga studio on the 14th floor, where a billiards room, a conference room and an 18-seat screening room are also located. 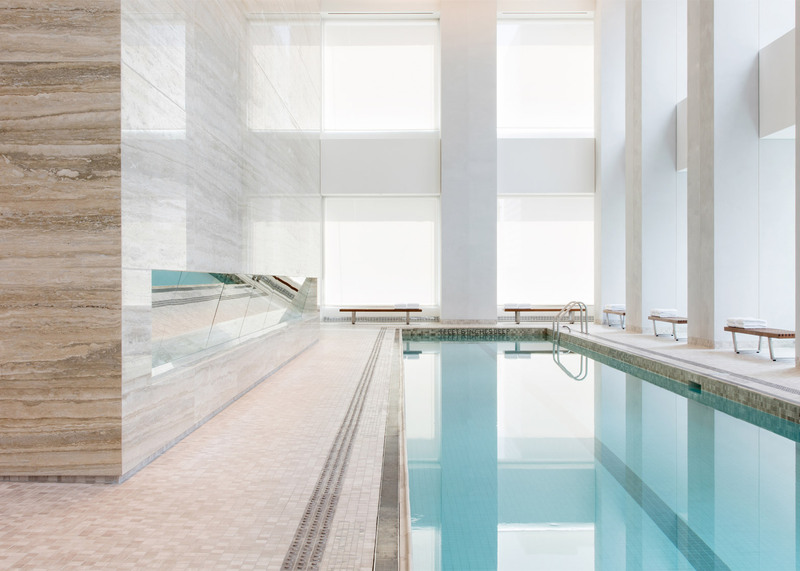 On the 16th floor, a 75-foot two-lane indoor swimming pool and jacuzzi are finished with travertine walls and flooring. 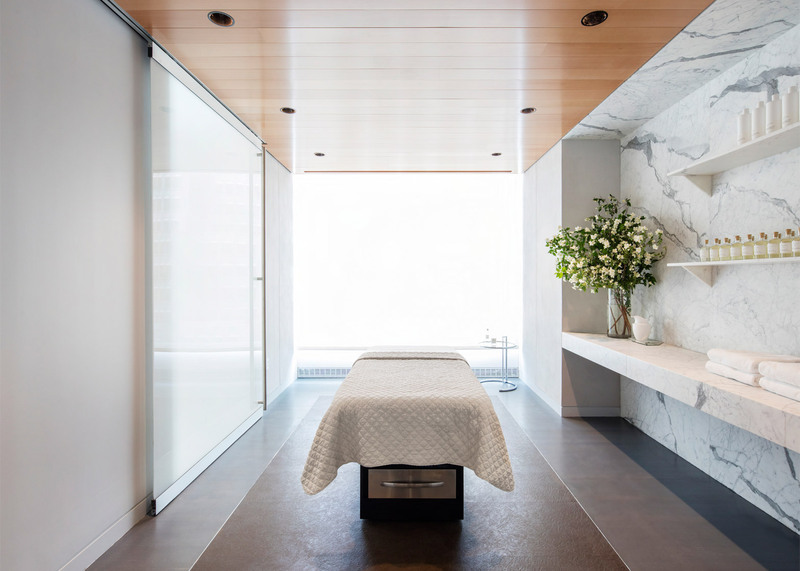 Changing areas feature steam, sauna, and treatment rooms for massage and spa services. A private restaurant run by a Michelin-starred chef is also set to open inside the tower. 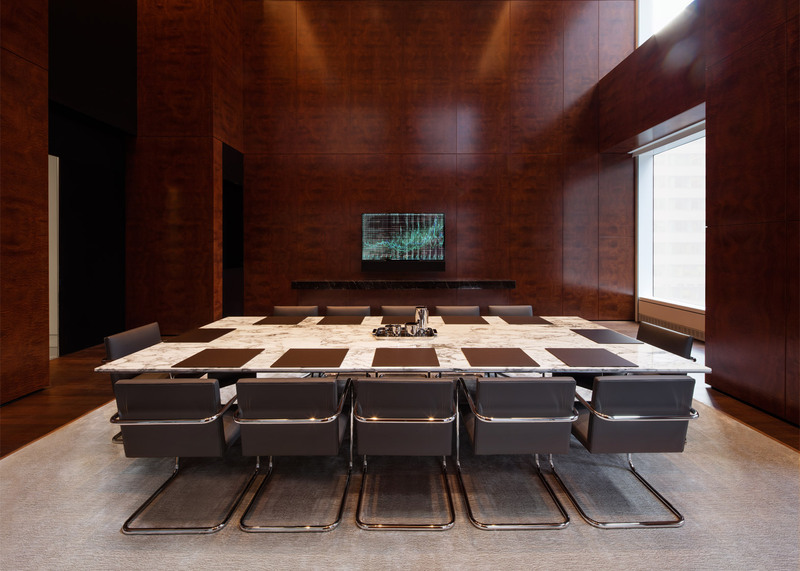 It will occupy the entire 12th floor and an adjacent 5,000-square-foot terrace overlooking 57th Street. Rafael Viñoly apologises for comments on 432 Park Avenue skyscraper "screw-ups"
Designed by hospitality specialists Bentel & Bentel, the space will include giant lighting installations by Czech brand Lasvit and Mid-century Modern furniture by American brand Knoll. "The restaurant will also offer a world-class wine program, as well as room service and in-home catering to residents," said the developers, CIM Group and Macklowe Properties. Elsewhere, the building also offers on-site climate-controlled wine cellars, office suites, studio apartments, private storage, and valet parking services for residents. 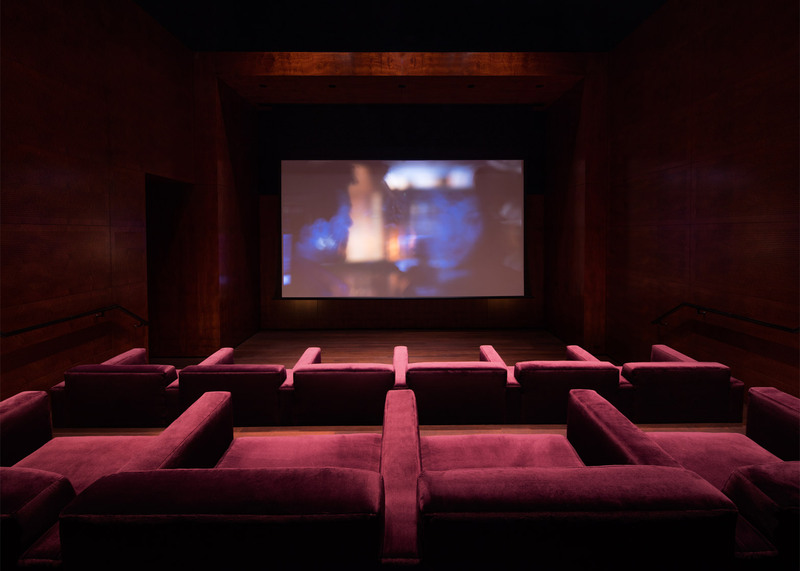 Interiors of the 106 condominiums were designed by New York architect Deborah Berke, who recently became dean at Yale School of Architecture. Construction on the 1,396-foot (426-metre) tower – currently the tallest residential tower in the western hemisphere – completed earlier this year. Viñoly recently spoke out about "screw-ups" with the skyscraper, but quickly apologised for his remarks. Shared amenities in luxury complexes are common, although rarely at this scale. At the other end of the spectrum, developers are also now including communal facilities for residents in co-living projects.